Phi Kappa Phi Graduation Cords are Navy Blue and Gold Braided Double Cords. The double cord is made up of two separate cords tied together in the middle with an overhand knot. Each of the two graduation cords that make up the double cord are gold/gold/navy, meaning that they have two strands of gold and one of navy blue intertwined on each cord. 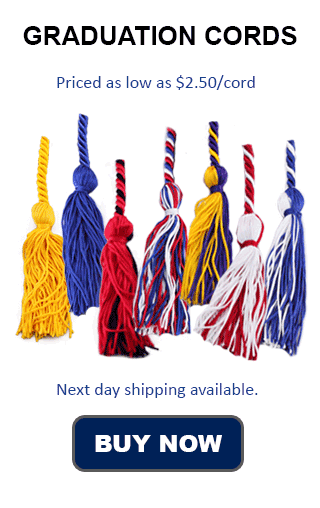 The cords are then capped on each end with a tassel that contains both the colors navy blue and gold in equal halves. Currently we do not carry this honor cord at Honors Graduation. Similar options that we can do for Phi Kappa Phi is a Gold with Royal Blue braided cord double tied. This cord would be the same in all aspects except that the blue color would be a little bit lighter than the blue in a navy blue and gold cord. We can also provide Navy Blue and Gold double cords, which would consist of a solid navy cord and a solid gold cord being tied together. Phi Kappa Phi was founded in 1897 at the University of Maine. It is an any-discipline society, and recognizes academic achievement in all areas of study. The society's motto,	Philosophia Krateito Photon, means "let the love of learning rule humanity." Currently there are over 300 chapters of Phi Kappa Phi, and they publish a publication called "The Forum." There are currently 71,000 collegiate members. Membership into Phi Kappa Phi is through invitation to the top 7.5% of Junior Year University Students in their second semester and the top 10% of undergraduate seniors and graduate students. There are chapters at Oregon State University, North Dakota State University, Samford University, and Louisiana Tech University among many others.